"The CraftCoin (CRA) is a digital crypto currency that makes it possible that with the aid of a digital token we can give our customers a voucher and therewith increase the demand for this special product. In that way the voucher philosophy opens a new dimension. 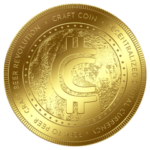 With our CraftCoins (CRA) we canalize the Craft Beer movement and aim for the growing attention for our Craft Beer Crypto. The joint food branch, especially the beer market, is international and thrives on import and export. A crypto currency makes handling more profitable, more secure and faster. CraftCoin thus simplifies worldwide trade, whereas a digital currency is already international by its nature."